Own a restaurant? Thanks to a host of hard, flat surfaces, your premises might be easier to clean – but are they comfortable for your diners? By that, of course, we don’t just mean 'are the seats soft?' and 'does the lighting reflect the right mood?'. What we do mean, then, is can your guests hear one another properly – or is noise reverberation making it difficult to chat comfortably? Those hard surfaces can mean that noise levels can be higher, which is a problem you could do without. But simply by adding some absorber panels or acoustic tiles to your restaurant, dining hall or café space, you can dramatically improve the reverberation time – and by doing that, you’ll ensure your customers’ dining experience is much more pleasant. Take a look at this research from Action on Hearing Loss, with regards to restaurant acoustics - and consider how you can improve your space in line with its findings. 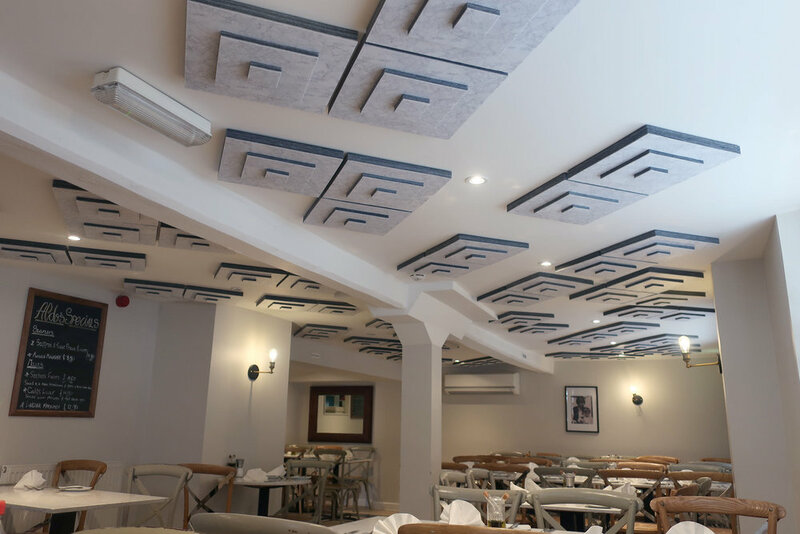 We’ve done just that recently, completing a TileAcoustics ceiling tile install at Aldo's Italian in Bradford with great success - see our Case Study and install pics below to discover how we helped. Don’t have much wall space in your restaurant? TileAcoustics is the perfect solution for the ceiling, since we can cut tiles in any shape or size and provide them with bespoke imagery or off-the-shelf fabrics. Installation is quick and easy, too; why not chat to us about how we can help?